The two application server instances were hosted in separate Solaris Containers. Each Container on the blades was connected to 2 subnets. betweem the drivers and the SUT. on each blade to connect to the switch. both containers shared e1000g3 for this subnet. DB2 processes bound across 38 processor cores using /usr/sbin/pbind. connections to the Sun Blade T6300 Modules. Only 1 NIC was used for the network traffic between the emulator and the SUT. Each blade was divided into 2 logical partitions using Solaris Containers. 2 satellite drivers ran in separate containers on each blade. Each container used a separate network interface to access the SUT. 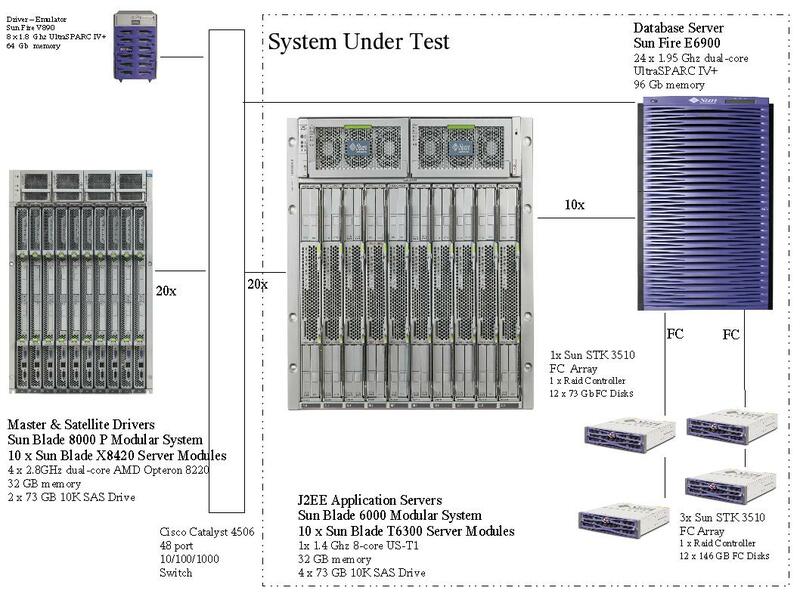 the four Sun StorageTek 3510 arrays. the server logs and filestore for JMS persistence. This extrapolates to 103 GB of storage for a 24 hour run. The database is configured with 6132 GB of storage.